Setting up for game fishing isn’t as easy as throwing a few lures out the back. A LOT of anglers buy boats for offshore and have an interest in setting up for game fishing, often with the aim of catching their first marlin or big tuna. This isn’t as easy as throwing a few lures out the back and hoping, and is, in general, quite an expensive business. The following is an overview of some of the basics as far as kitting out your vessel so you can successfully chase big pelagic game fish from inshore species up to larger marlin. Once you’ve got your gear sorted out, from the boat through to the lures, you’re ready to try your hand at catching huge fish in the open sea. Most game fishing is done by trolling, using either lures, dead and live baits and teasers that attract fish to the wake of your boat. In general you’ll require at least three outfits to set up a trolling spread but four or five is generally preferable. The type of outfits you need to buy depends on the size and type of fish you’re chasing, but one of the major factors in choosing a reel is line capacity. For this reason most game fishos prefer traditional overhead style reels holding at least 500 m of line. It’s not uncommon to lose several hundred metres of line on the first run of a tuna or a marlin, and with bigger blue marlin you can lose the whole spool of line in less than a minute. When you’re starting out you need a good idea of the type of fish you are likely to encounter and select a line class that is adequate for the fish you chase. I like to fish a variety of line classes as we chase a wide range of species from mackerel to blue marlin, but in general for most fish species up to about 80 kg in weight, 15 kg tackle is adequate and a good line class to begin with if you are just starting out. Want to catch a fish like this? Read this article! I don’t generally plug particular types of tackle, but if you’re starting out in game fishing and setting up a spread of outfits it is hard to go past a lot of the Shimano range. Both the TLD series and Trynos reels have served me well for many years now as far as light and medium tackle outfits are concerned. The drags are excellent, the line capacity is good and they are generally quite trouble free. Most game fishing is done with nylon monofilament as the mainline on light and medium tackle. I like to use Berkley Big Game monofilament which comes in 1200 m spools. When you’re spooling your reels up it’s important to do this under tension so when a fish is hooked the line on the reel doesn’t bury under loose line on the spool. A lot of tackle shops have spooling machines and can fill your reels at a minimal cost if you buy your gear at the same shop. Don’t overfill the reel with mono, as you need space for a wind on leader and a bit of leeway in case your angler doesn’t spread the line evenly on the spool while fighting a fish. Once your outfits are filled with line it’s time to get down to rigging your leaders and terminals. Leader is an integral part of all game fishing. This lets you control the fish at the boat, stops abrasions from fins, bills and teeth and makes tagging, gaffing and release of the fish much easier. There are different types of leader systems but nearly all of them require a short length of double line at the end of the mainline. Tying a “double” is a very important knot to learn. The Bimini Twist and Plait take a little while to master. The weaker “Spider Hitch” is relatively easy but a far inferior knot. These knots are all on YouTube in various types of tutorial formats. I much prefer to plait my doubles and with practice find this the easiest way to tie double knots in nylon monofilament. Once your double is tied you can use the loop to connect to a swivel or wind on leader. If you are just starting out, buy a few commercially made wind on leaders of suitable breaking strain. In general, for 15 kilo tackle, a 100 or 150 pound line wind on leader is about right. A ball bearing swivel is crimped to the end of the wind on leader. Alternatively, you can tie a ball bearing snap swivel to the end of your double, making sure that both ends of the double line pull up evenly. This method requires you to rig the leader on the lure or bait and attach that end to the swivel. In general, this requires longer leaders on your lures and means you are unable to wind the leader onto the reel which gives you less control at the end of the fight. For this reason I prefer to use wind on leaders. As you get more experienced it’s pretty easy to make your own wind on leaders but you will need to purchase a good needle kit to work with. Game fishing rods work as simple levers and are designed for fighting fish rather than casting and retrieving. They’re generally quite simple rods. A good roller guide tip reduces friction when the line crosses it, and game fishing rods can be fully rollered, have standard guides and a roller tip, or have a full set of standard guides. While roller guides are the best as far as reducing line friction, beware of cheap roller guides that corrode and quickly don’t turn. These cheap rollers are far inferior to ring guides in the long term. Once again, there are some excellent rods in the Shimano range that are excellent value. Once the rods and reels are sorted it is time to look at lures, hooks and all the other accessories required for successful game fishing. You will need a collection of skirted trolling lures, some decent hard bodied minnows, a few stick baits and plenty of made up rigs for both live and dead baits. If you intend targeting sharks, mackerel or wahoo you will also need a wire kit and a range of wire leaders. You will need a collection of skirted trolling lures. 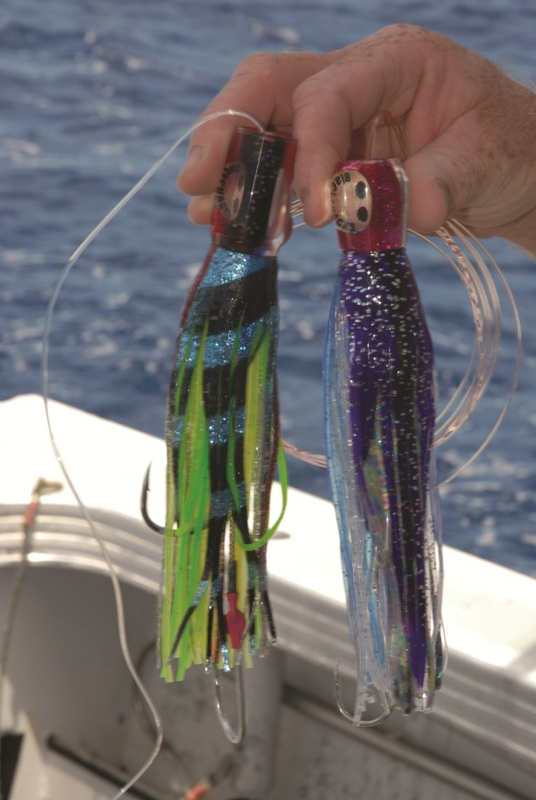 Skirted trolling lures consist of a moulded resin or plastic head to which a pair of plastic octopus style plastic skirts are attached. As the head wobbles while being dragged along, it kicks the skirts so they move in a natural fashion imitating a fleeing baitfish or squid. The natural aggression of fish like tuna, wahoo, dolphin fish and marlin attracts them to this illusion and the hungry ones eat the lure. The strike rate, however, is far inferior in general to live baits and dead baits. A lot of fish look at the lures but don’t eat them. Skirted trolling lures are rigged with one or two single hooks and can be trolled at speeds of 6 to 10 knots. For medium tackle I like to use lures between 15 and 25cm in length. These are generally rigged on either light sharp hooks like the BKKs or Gamakatsu SL12 in size 10/0, or on Mustad 7691S 9/0 hooks if a more solid hook is required. Good brands of skirted lures include Black Snacks, Meridians, Pakulas and J.B. lures. Ask for advice from your local shops as they generally know what is selling well and can be a great source of local advice. Carry a range of different colours as fish preferences can, for unknown reasons, be quite fickle at times. Reliable colour combinations include purple over pink, lumo white and green, blue and silver and “evil” (blue and silver over green and gold). If you’re starting out you can buy pre made rigs on which to rig your lures. Hard bodied minnow lures are also very useful tools for a variety of game fish such as Spanish mackerel, wahoo, tuna and kingfish. These lures need to be capable of being trolled at around 8 or 9 knots so they can be used in conjunction with skirted lures. 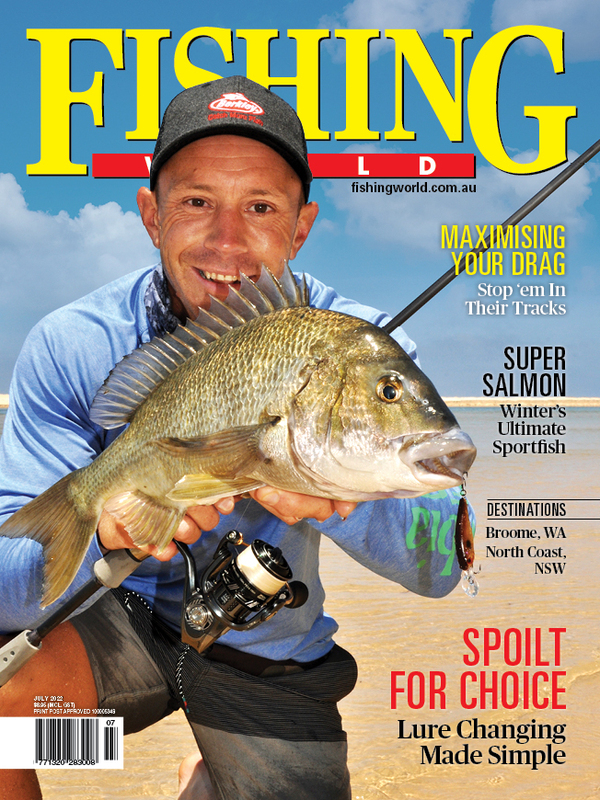 These lures travel at depths of one to four metres and can be trolled on both the short lines close to the boat or on the “shot gun” lure, positioned a long way back from the boat wake. I’ve experimented with a lot of hard bodied lures over many years and find the Australian designed Halco Laser Pro lures to be the most reliable and trouble free lures out of the many I have tried. 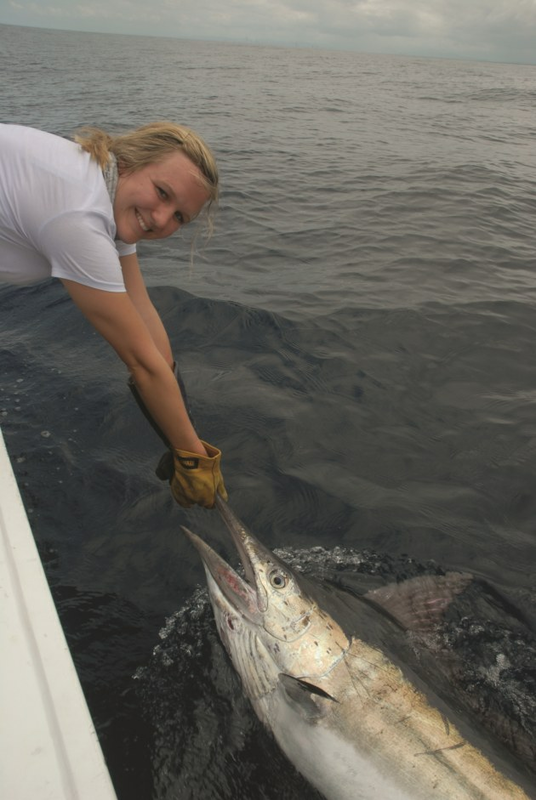 They also catch a surprising number of marlin, particularly when re-rigged with single hooks. If the mackerel or wahoo are about in numbers I rig these lures on a short length of wire leader to avoid bite offs. The next part of your game fishing kit are your pre made rigs for live baits and dead baits. These will vary according to your target species. I carry a wide range of pre made rigs including circle hooks on hundred pound leaders for live baiting for marlin around bait schools, wahoo rigs for trolling small tuna which consist of a pair of 10/0s rigged on wire cable, a range of mackerel rigs on wire traces and a few larger rigs for trolling live tuna for bigger marlin. These are all carried in a large rigging wallet and can be quickly clipped on as required. I also carry a number of multi hook bait jigs for catching live baits in the same wallet. 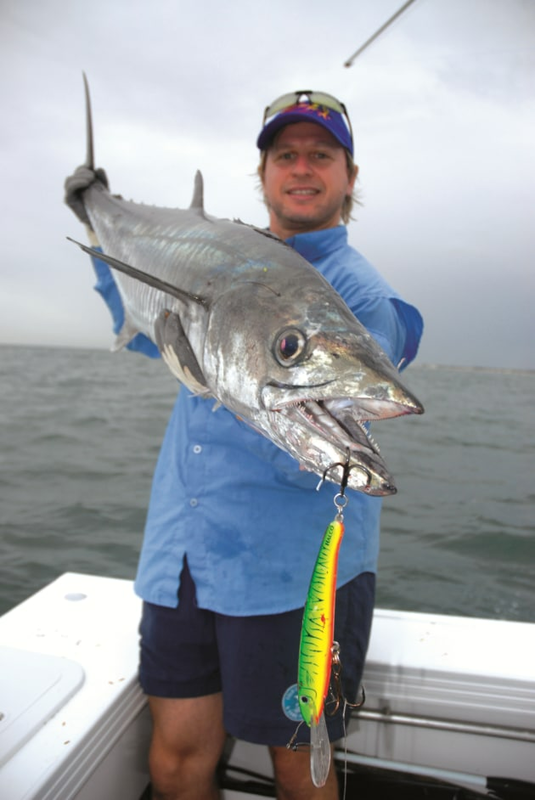 Hard bodied minnow lures are also very useful tools for fish such as Spanish mackerel. The next part of your game fishing equipment are your tools and accessories to make the job easier. For light tackle you need a decent rod bucket, and for heavier tackle such as stand up 37 kilo gear, you need a harness. A simple gimbal belt that sits comfortably across your thighs and has a solid belt makes fighting fish much easier and is an important part of your game fishing kit bag. The next important part of your kit includes a belt on which you have knife, line cutters and pliers. This is vital equipment if you are leadering a big fish such as a marlin and need to get the hooks out or cut the line quickly if misadventure occurs. A good pair of leadering gloves is another essential part of the kit bag, and it pays to carry at least two pairs. I prefer the old style welding gloves that also protect the wrists and forearms. Smaller black marlin around 30 to 40 kilos are the most dangerous fish we regularly encounter and when you grab them by the bill it can be a wild ride! The bigger blue marlin are generally tired by the time we get them to the boat and are generally a lot more cooperative. When leadering big fish it is important to keep the boat going forwards and keep the fish swimming with you. It is dangerous to hang on to marlin too hard. If they jump on the leader and you roll them over in the air the next jump can take them straight into the boat, a situation I’ve experienced once and do not want to repeat! Make sure you have a decent range of gaffs on board. Highly prized edible species such as dolphin fish and wahoo are fabulous to eat but need to be treated with respect. For wahoo, gaff them in the head and dispatch them with a club. For dolphin fish, take extreme care. I prefer to gaff them in the head and quickly get control of them on the deck by folding the tail up so they can’t thrash around. We then have a hook on the end of a lanyard that is used to tie the fish up. This avoids a huge amount of mess and prevents the flesh being bruised. In addition to all of the above, there are rigging kits, crimping gear, cutters and a whole range of rigging terminals required to fill your game fishing needs. It’s a never ending but very enjoyable business and game fishing is one of the most absorbing types of fishing there is where you always have the chance of encountering truly huge fish.